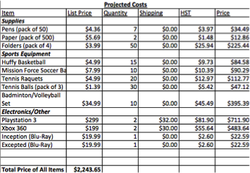 This spreadsheet showcased the total amount of money that we spent on items to be used at the Retreat. It specifies each item and different information about those items, this information includes, the price, the quantity, the tax (HST) and the final price. 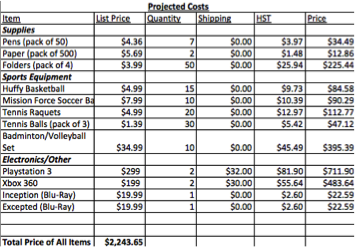 For this spreadsheet, we needed to research on various websites to find the best and cheapest prices for thee products. This spreadsheet was about the total expenses incurred during the excursion. This data includes, the price of all the items and supplies needed, the cost of the hotel, meals and transportation. It also includes the price of the visitors. This spreadsheet is essential because without it we would not know how much of our budget we have spent and have remaining. This spreadsheet is just like the supporting materials spreadsheet except instead of going into detail about where we buy the products from, it is talking more about the price and what we will be paying. It talks about shipping, HST, and quantity. This chart was used for finding the project revenue. The projected revenue is a chart that summarizes our total budget. As seen, we have a total of $27,000 - $17,000 from the students and $10,000 worth of school budget. This is the final spreadsheet that summarizes all the previous spreadsheet’s data into one. 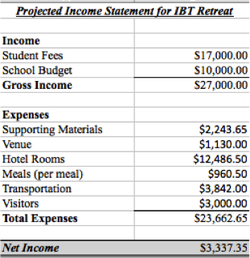 Here, we see the total expenses, the total income and the net income. The net income is the amount of money that we have left after purchasing and spending our money on the budget. We had $3,337.35.